Monday–Thursday • 9:00 a.m. to 8:00 p.m.
Friday • 9:30 a.m. to 6:00 p.m.
Saturday • 9:30 a.m. to 5:00 p.m.
Sunday • 1:00 p.m. to 5:00 p.m. The Hewitt Public Library (HPL) has a new home at 200 Patriot Court, and it is quite impressive. Visitors will be amazed at the new state-of-the-art facility—from its clean and modern architecture, to the colorful stained glass and décor, to the new Pet Zone. 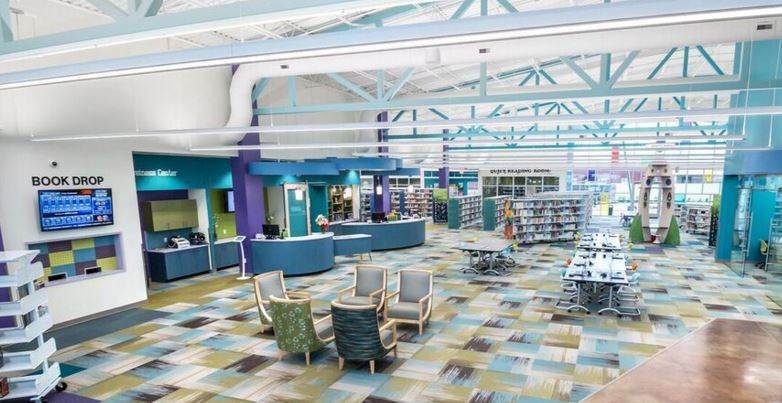 The Library also features a coffee bar, museum space and an outdoor butterfly garden, as well as a 3-D printer in the Teen Zone, along with video-editing and audio equipment. can expect the same high level of service from the same kind and helpful staff that has been serving the greater Hewitt area over the past 30 years. “Dog Days r Canine Event”—designed to be a fun family day where folks can enjoy a variety of activities, learn from canine experts, and connect with other dog-lovers. The future is bright at the Hewitt Public Library, and the staff would be honored to serve you. Non-residents and residents alike are invited to get a library card. For more information, call (254) 666-2442. Stay in the know by visiting Hewitt Public Library on Facebook!